Hey there, everyone! So, this is a bit of a departure for this blog, but I figured I should start releasing raw scans on here, as well. These two volumes were personally de-binded and scanned in by your’s truly. Now, some information about the series. 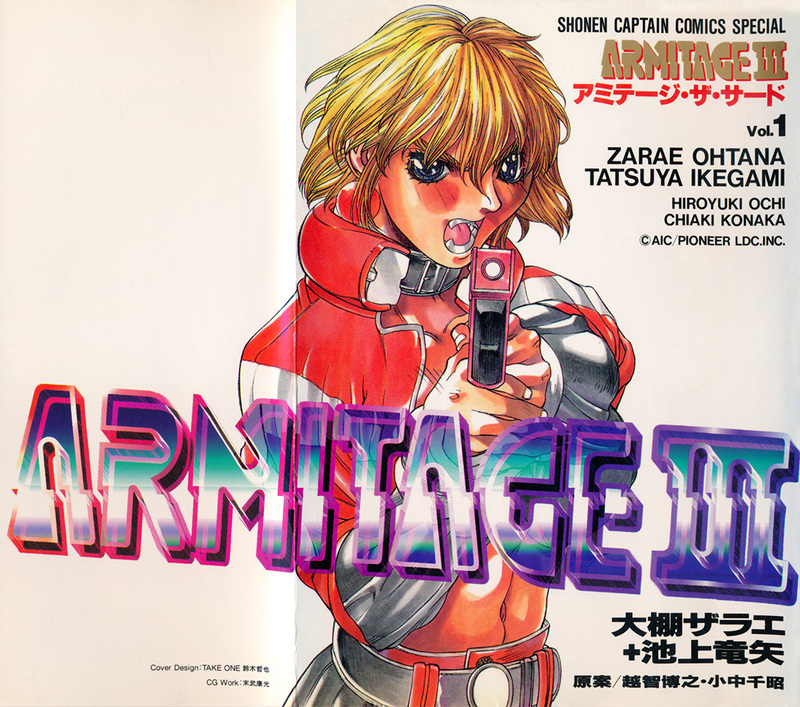 I’m sure many of you are familiar with Armitage the Third from it’s OVA anime series, which was released between Feb 25, 1995 and Nov 25, 1995. Well, this manga was serialized at the same time by Tokuma Shoten in the magazine Shounen Captain, from Feb 1995- Oct 1995 (Mar to Nov issues) for a total of 9 chapters. The chapters were later collected into two tankobans, both being released in October 1995, with the second volume also publishing two bonus chapters only seen in the volume, some chapter profiles, and an episode guide for the anime. These scans come from those two tankobans. Art is credited to IKEGAMI Tatsuya & OCHI Hiroyuki, while the Story is credited to KONAKA Chiaki & OHTANA Zarae. Anyway, I’m looking to get into scanning raws a bit more, so look forward to more of this kind of thing in the future. I’ll likely stick with scanning in 90s and 80s series, since that’s what I’m most interested in. In fact, I’ve got a few one-volume series from the 80s to scan in next, so look forward to those. This entry was posted in Raw Japanese Scans, Releases and tagged 1990s, IKEGAMI Tatsuya, KONAKA Chiaki, OCHI Hiroyuki, OHTANA Zarae, Shounen Captain, Tokuma Shoten.